“Tonight, President Obama presented the right analysis of the situation in Afghanistan but reached the wrong conclusion. 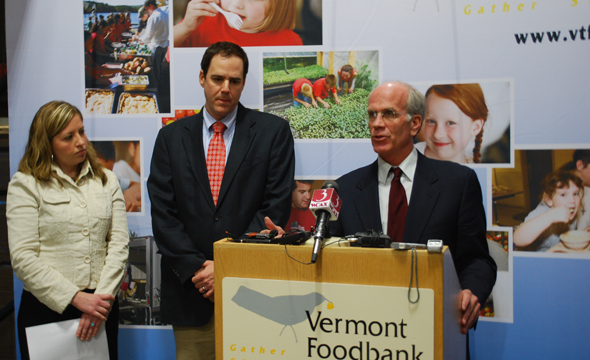 During a visit to the Vermont Foodbank on Monday, Rep. Peter Welch highlighted the rise of hunger in Vermont and urged the federal government to take a comprehensive approach to ending hunger throughout the country. Rep. Peter Welch on Thursday highlighted a new Government Accountability Office report showing that credit card interchange fees – or ‘swipe fees’ – hurt small businesses and consumers. With Rep. Peter Welch’s support, the U.S. House passed legislation late Wednesday investing in firefighter assistance programs. The bill passed by a bipartisan vote of 395 to 31. Welch joins Sens. Brown and Merkley to launch "Rebuilding America"
Vermont and seven other states will share nearly $4 million in economic stimulus funding announced today under a green jobs program that was authored by Sen. Bernie Sanders (I-Vt.). Sens. Patrick Leahy (D-Vt.) and Bernie Sanders (I-Vt.) and Rep. Peter Welch (D-Vt.) today announced that the Village of Barton will receive $2.8 million for water system improvements funded by the American Recovery and Reinvestment Act. In the wake of allegations that Blackwater Worldwide engaged in the bribery of Iraqi officials following a September 2007 shooting incident, Rep. Peter Welch on Wednesday called for an investigation of the company – now called Xe Services – by the House Committee on Oversight and Government Reform.